Topic: Head in a Swirl, by any Chance? While I think about it: Designer of Swirl? There is a suspicion that it could have been Robert Goodden, who also designed Spiderweb. As yet unconfirmed. Also in the early Thirties began Goodden's involvement with the industrial manufacturers Chance Brothers, designing mass-produced pressed domestic glassware, a relationship that continued until 1948. You mention the boxes in your subsequent posting David. Is it worth getting my swirl box out and photographing it? Anne: That would fit as Goodden also designed Lotus (1948), but I wonder how reliable it is. Perhaps Goodden took on the odd commission afterwards? More confirmation needed. After 1948 he designed for various places e.g. Wedgewood, but was primarily a professor at the RCA, and then involved with the Festival of Britain and some prestigious commissions - such as a kettle for the Duke of Edinburgh (it was a Xmas pressie for the Queen apparently!) I've read all the obits I can find online (around 6 of them) and they all include slightly varied detail but they all refer to the glass designs as either during the time Goodden had his own design practice (1933-39) or before 1948. Thanks for that: I wasn't doubting this, but from past experience it's unwise to rely on a single written report. But if this information is being substantiated that's fair enough. I also checked the Dictionary of National Biography (DNB) as our county libraries have a remote access deal with them (in fact most libraries subscribe) and their very detailed bio substantiates what I read in the Goodden obits as well. What I haven't been able to find is any supporting evidence for the alleged Casson designs - all I find when searching for Casson and Glass are the endless eBay items. I did read that there's something in Jackson's 20th Century Factory Glass about this but as I don't have a copy I cannot confirm. Can someone with the book check the reference for Margaret Casson and see if there's a quoted source for the info please? Can someone with the book check the reference for Margaret Casson and see if there's a quoted source for the info please? Lesley Jackson mentions Swirl, dates it to 1955, production to "mid-1960s" and describes it as "a pin-wheel pattern printed in dove grey". It goes on to say "Swirl was followed by a knobbly-line pattern called Night Sky (1957), inspired by diagrams of stellar formations, which was designed by Margaret Casson, along with Green Leaves (1958)." So she gives no designer for Swirl. There are no references for the Casson attributions of Night Sky and Green Leaves. Lesley Jackson mentions Swirl, dates it to 1955, production to "mid-1960s" and describes it as "a pin-wheel pattern printed in dove grey". It goes on to say "Swirl was followed by a knobbly-line pattern called Night Sky (1957), inspired by diagrams of stellar formations, which was designed by Margaret Casson, along with Green Leaves (1958)." So she gives no designer for Swirl. There are no references for the information. I'm not entirely conviced that Swirl finished production in the mid-60s. I have one of Chance's publicity card, early 1970s, that promotes the gilt version of Swirl, but there is not mention of it in the 1976 price list. However, I do respect LJs opinion in not attributing it to Margaret Casson. I'd still like to know who to give credit to though! But sufficiently badly edited that it easy to see why literate eBayers would misread it. It has a comma in it for one. After the first few sell well, people take notes and :idea: a myth. But the key is in the words "which was". Singular and refering to the last item: Night Sky. Hard to see how people could have mistaken this. Blinkered with rose-tinted specs at the same time! Blinkered with rose-tinted specs at the same time! I agree entirely, including C20th "Roadshow" Experts. I'm sure, if I remember correctly, Margaret Casson was named as designer when they did Chance Swirl :lol:. Anyway, here's more overlapping gold. 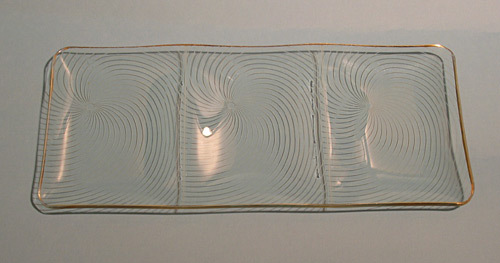 A three sectioned rectangular dish. Here's the edge. The edge is basically ground flat, with a very slight bevel on the top (but not on the bottom of the edge) that I think is similar to that mentioned by Sue. 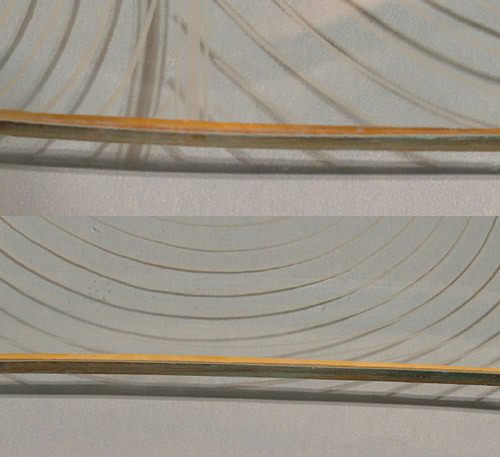 The swirls are in the right direction and they go the the very edge of the underneath.